Equipping the borehole with a larger cistern, animal drinking basins linked directly to faucets, and better piping with additional faucets for human consumption. The community has been asked to contribute to the infrastructure by building a wall/barrier separating the animal from the human side and protecting the borehole and cistern structure. They will also be actively involved in the construction process so they can have a better understanding of how the system operates. We will hire technicians to better train committee members responsible for the technical maintenance of the borehole. We will continue training committee members as well as other beneficiaries in proper hygiene and sanitation behavior in order to maintain the water potable for human consumption. 2) Launch a bid for one or two boreholes, in order to hire a contractor for the construction of our next boreholes. During our field visit, we covered over 200 km 2, and have chosen 14 potential sites for future boreholes (sites cover both the Tchintabaradene and Abalak districts). We are currently waiting on the geophysical analysis to determine which sites we need to make a priority based on the depth of the water table. The geophysical situation is being analyzed both by the Department of Hydraulics in Tahoua and by Mary Ohren of the Desert Research Institute, and Ron Peterson, independent geological consultant. In order to reach a permanent and sustainable water source, we must drill to the "Continental Intercalaire" (CI), an underground water table that flows across Niger . The CI can be reached at approximately 200 meters to the East of our target area, and is found deeper and deeper as you go to the west. 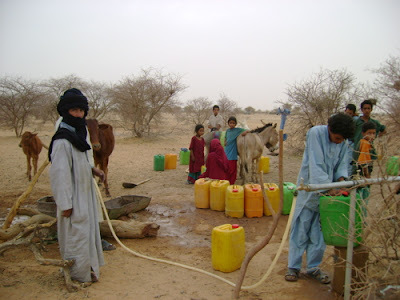 Near the Malian border the CI can be reached at approximately 800 meters. · Thanks to information we obtained from the department of Hydraulics in Tahoua, we were able to determine a large region of the Azawak where the water table is known to be at 250 meters or less. Given that our funds all come from private donors, we cannot currently afford to build a borehole deeper than 250 meters. We therefore focused our attention on this region. · We obtained names of sites from the department of hydraulics in Tchintabaradene as well as the mayor's office. We also questioned influential members in villages and camps and asked where their needs would be best served. a. Is there a need for a water point in this area? b. What type of water point would you like to have in this community? c. Could you financially and structurally manage a diesel group engine, if this is the type of infrastructure you desire (mentioning price estimates, maintenance, the possibility for environmental degradation, etc.)? d. How do you conceive managing the water point and ascertaining the financial viability for maintenance and diesel costs? e. How do you envision the role of women as active participants for the proper management of your water source? f. What kind of contribution can the community make towards building the water point? g. How many people and livestock would benefit from this water point? h. How far do people currently travel to find water in this area? · We therefore determined sites based on recommendations, requests from the beneficiaries, actual need, as well as the capacity of beneficiaries to manage their water point. While we were in the Azawak, we also visited several boreholes run with diesel group engines in order to determine if these were being successfully managed, to learn how these were run, and establish benefits and problems associated with this type of infrastructure. We visited the boreholes and then conducted a group questionnaire to management committee members, as well as other village leaders. Some boreholes were poorly managed, and others very well managed. Those that were well managed had undergone a great deal of follow up after borehole construction (including excessive training of community members in technical management, financial management, organizational management, and hygiene and sanitation) and active involvement on the part of committee members and beneficiaries. Those that were not successful were those built by organizations that did not follow up after the construction of the borehole. Beneficiaries were left with a complex infrastructure that they did not know how to manage. Thus, the major lesson learned after our visit to existing boreholes is the following: in order to ensure the long term success of the boreholes, there is a need for long-term follow up including monitoring and training for several years after the construction of the borehole. There is also a need for beneficiary involvement during the construction phase so that they feel they have invested in the borehole, and understand that THEY (with our help initially) are the ones responsible for ensuring the survival of their water source.